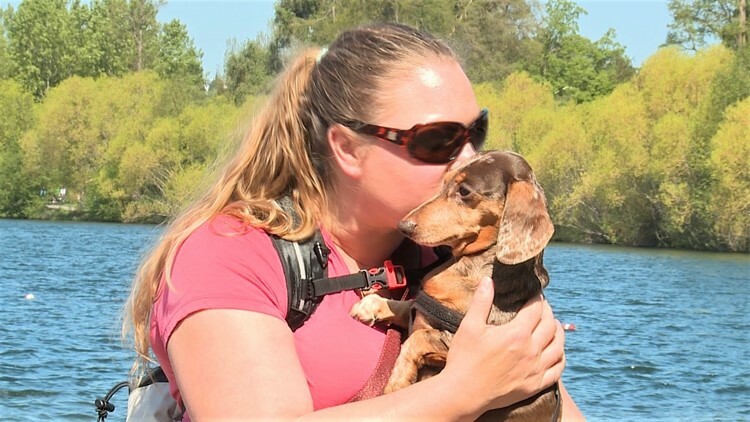 "The misconception with a lot of people is that the size of the dog equates to their athletic ability or endurance, but that's not true," said Jessica Williams, Founder of Adventureweiner Club. Meet the pups that prove size doesn't matter... it's Seattle's Adventureweiner Club. It's a big parade of little paws. Some might even say it's "weinerpalooza" in Seattle. "It's all about getting people active with their dogs," said Jessica Williams, Founder of Adventureweiner Club. "We love getting out of the house with the puppies and honestly, they do much better when they are around other Dachshunds. They know when they are safe with their herd, this is when we get our best walk in," said club member Holly Yuser. While they may be little - they are fierce and they do have something to say. "The misconception with a lot of people is that the size of the dog equates to their athletic ability or endurance, but that's not true," said Williams. "Most of the Dachshunds could out hike me any day. I'm the one that stops at about 10 miles, she can go farther and certainly wants to go faster than I can go." This monthly walk around Greenlake is designed to be accessible to people and pups of all skill levels, but the adventures don't stop here. "My friends are like wait, 'you took your Dachshund with you hiking?' We get comments all the time about people asking if we had to carry them up or about how their legs must get tired, but it's just not the case." Questions like that are exactly why Williams founded the group. "I wanted to show that small dogs can do a lot and make great adventure companions. Companions for not only for humans but for each other." Williams also started a full range social media outlet for all her Dachshund stories and photos. She recently won the "BlogPaws 2018 Nose-to-Nose Pet Blogging and Social Media award". "Sam (referring to her pup) loves all dogs, but as soon as he gets here and sees all the other weiner dogs then it's game on. He's with his peeps and they seem to know right away that they are part of the pack," said club member Heather Garbie. Together - these pals are proving size doesn't matter. If you are interested in seeing more weiner dogs in action you can follow Jessica's Facebook, Instagram, and blog.